Originally slated for release in the heart of the December movie awards season, The Monuments Men was suddenly pushed into the February dump zone mere weeks before its scheduled opening. Considering the pedigree of its filmmakers and cast, the change was jarring and foreboding. The good news is that writer, director and star George Clooney’s latest vanity project is not the unadulterated disaster its release date portends. The bad news? The impetus for shifting that release date is patently clear. Adapted by Clooney and longtime collaborator Grant Heslov from a book by Robert M. Edsel, the film tells the little-known true story of an Allied task force assigned to traverse the European theatre and save millions of pieces of art and other culturally significant items from the Nazis near the end of World War II, especially before their destruction on orders from Adolf Hitler. Frank Stokes (Clooney), the leader of the squad, recruits a band of past-their-prime art experts. However, instead of an earnest, dramatic rendering of their mission and the motives of their adversaries, the breezy screenplay pairs its protagonists off in order to conjure subplots and kill screentime. So, John Goodman and Jean Dujardin play the ugly American and sophisticated Frenchman. Bill Murray and Bob Balaban carry on a dull Mutt & Jeff routine. And, George Clooney and Brit Hugh Bonneville are full of charm and charisma. Meanwhile, Matt Damon travels to Paris to woo information out of a wary former museum curator, played by Cate Blanchett. Yes, it’s Ocean’s WWII, except that amid the wise-cracking homage to the homespun Hollywood war pictures of yesteryear, there are deaths and other deadly serious subject matter at hand that lend the film a tonal inconsistency. Clooney and Damon are charming enough, but Murray is virtually neutered. Meanwhile, Blanchett’s role is fatally uneven—one moment she’s aiding the French resistance, the next she’s inexplicably jailed for being a Nazi collaborator; she goes to tremendous lengths (including the offscreen death of her brother) to keep artwork from being removed by the Nazis, yet she tarries when the Americans ask for her help in retrieving it (presumably to chew up even more screentime). Indeed, there are extended sequences that exist for seemingly no reason other than eating up the nearly two hour running time—other examples include Murray and Balaban’s nocturnal encounter with a young German soldier, and the squad’s slaphappy response after Damon’s character accidently stands on a landmine. Ultimately, the actual race to retrieve the works of Rembrandt, Rubens and Rodin before the Nazis can torch them or the Ruskies can pilfer for themselves occupies the final act of the film. 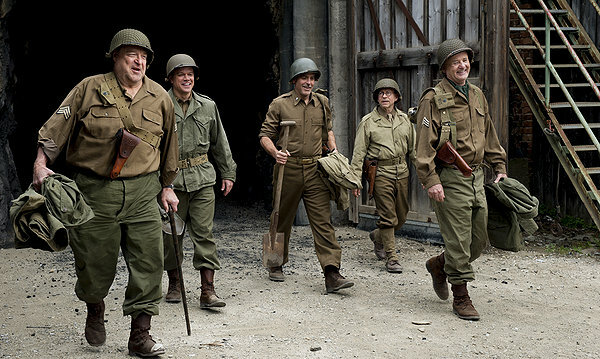 By then, The Monuments Men has mustered all the heft of a History Channel docudrama. That’s not all bad, especially if it awakens viewers young and old to the importance of classical art. But, a stroll through a gallery might accomplish the same thing and be twice as exciting.